You've got one more week to check out Guns: Loaded Conversations at the San Jose Museum of Quilts and Textiles. So go! Few issues are so polarizing politically, but as the number of mass shootings mount, artists across the country are taking to their studios to comment, persuade and provoke. "I had to use my platform as a curator," says Amy DiPlacido, who says one of her first priorities upon getting the job in San Jose was to do something in response to the shootings at Pulse, a nightclub in Orlando, Florida, which left 49 dead and 53 wounded in 2016. But really, take your pick from a host of mass shootings before and after that. 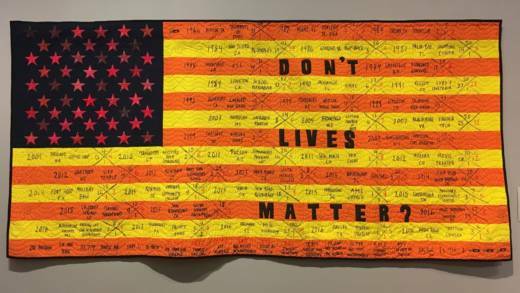 DiPlacido collaborated with the nonprofit Studio Art Quilt Associates, adding local, Bay Area contributions to this international traveling exhibition addressing gun violence. The result is a comprehensive survey of emotion and politics in more than 40 works of textile art. Most people think of quilts as folksy bed linens, but textile art has been political from the get-go. Think of Betsy Ross. Quilts were sold in the early 19th century to raise funds for the abolitionist movement. More recently, gay rights activist Cleve Jones conceived of the AIDS Memorial Quilt in the mid-1980s. It’s hard to pick which piece is most affecting. 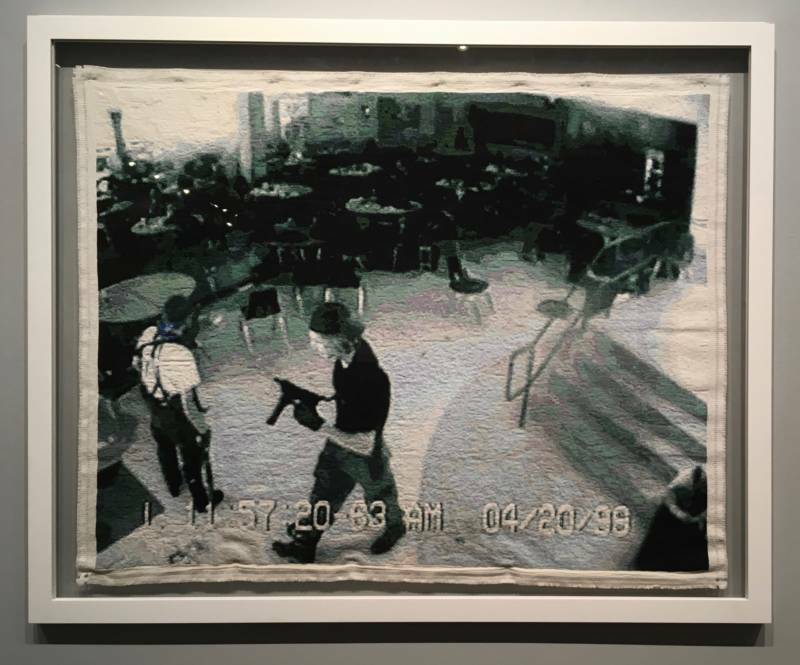 For me, it might be Noelle Mason's “Nothing Much Happened Today (for Eric and Dylan),” a landscape-sized cross-stitch embroidery version of a still from security footage of the Columbine High School Massacre. It might be the disjuncture between this sedate art form, usually found on throw pillows and comfy beds, and the implied violence of the image -- not to mention our memories of it. There's no violence happening in the image itself, but I know the story, and so my throat clutches. The hair on the back of my neck rises. 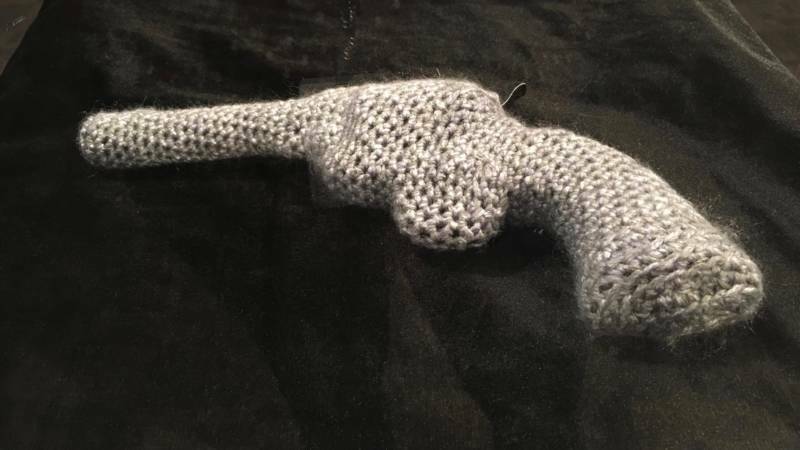 I had a similar reaction to a real revolver covered in crochet, by the East Bay artist Modesto Covarrubias. He's done this thing a number of times with guns and grenades. DiPlacido says, "You have something very hard underneath, which is the gun. And then you have this kind of soft embrace of textures over this piece, so it doesn’t look so threatening anymore." This textile art may not be threatening, but it’s provocative. Not all the art is anti-gun, but most of it is. Or to be fair, the art is anti-gun violence. "Honestly, there have been a couple of people who didn't like what we were presenting," acknowledges DiPlacido. "If that's happening, then you're doing something right. You have a fruitful conversation happening," she says. 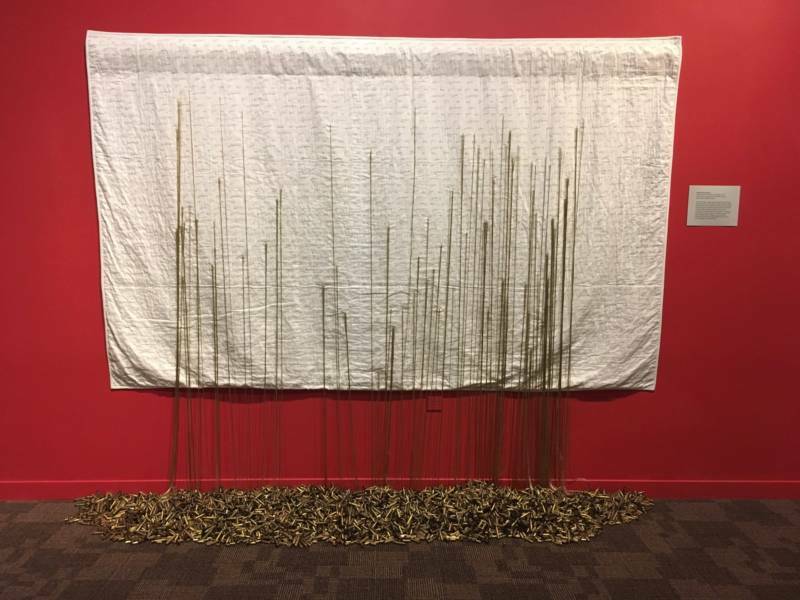 The museum is also featuring a parallel exhibition by the Bay Area’s Social Justice Sewing Academy, featuring cross-stitch and quilting by young people around the Bay Area whose work focuses on social justice issues. Angela Gleason of Santa Cruz came up to San Jose to see this exhibition. She’s a jeweler and she makes necklaces that bear the names of people shot in America. "I’m especially moved by the pieces that were made by children and by people incarcerated in the Bay Area. That's pretty powerful stuff." To close out the show, the museum will host a talk led by Stanford law Prof. John J. Donohue called “Bang! Bang! Discussing America’s Second Amendment,” on July 15. “Guns: Loaded Conversations” runs through July 15 at the San Jose Museum of Quilts and Textiles. For more information, click here.